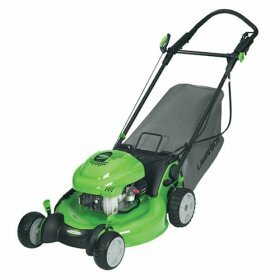 Lawn Boy Insight Series 10686 I recently bought the Lawn Boy 10686 model walk behind lawn mower. I have used it about a dozen or so times to mow my half acre lawn. The mower has stared right up the first time every time. The best thing about this mower is its sens-a-speed drive system. It adjusts the speed of its wheels to your personal walking speed. I've used mowers before that are too fast and drag you around your lawn and others that go too slow and take forever to get the job done. The 10686 eliminates both of these problems. If you have a hilly lawn it easily climbs grades and doesn't pull you down hills. You can walk at a good pace and the quality of the grass cutting is not diminished. With some other mowers, if you walk too fast it will actually leave some areas that it hasn't cut properly, leaving you with an un-professional and messy looking lawn. Overall mowing your lawn with the 10686 model is just like taking a walk. There is very little effort put into pushing this mower and it also seems easier to keep it in a straight line, much more so than previous mowers I have owned. The actual weight of the mower is around 88lbs, but it seems much lighter when using it. Another benefit I have noticed is when mowing tall wet grass,...IT DOESN'T CLOG!! To me clogging has been the single most annoying part of mowing in the past and with this model I haven't had any problems and I've took it through some pretty rough, tall, and wet grass. My 10862"s transmission has went twice in 5 years. that is lame for a lawnboy!